The ‘797 patent describes a touch screen input for use in primarily rpg games, posited a solution to traditional touch screens, which block some portion of the field of play when in use. The device includes a display in addition to a plurality of touch panels, each of which is able to control specific aspects of gameplay. A video game processing apparatus for controlling progress of a video game by displaying an object on a display screen of a display device is provided. 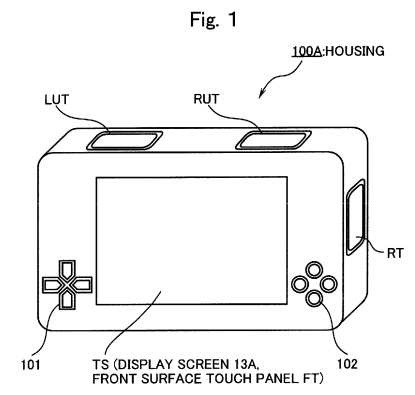 The videogame processing apparatus includes a plurality of touch panels respectively provided on a plurality of surfaces of all of surfaces on a housing of the videogame processing apparatus. The video game processing apparatus receives a touch operation for any one of the plurality of touch panels, and determines which surface of the housing contains the touch panel for which the touch operation is received. The video game processing apparatus carries out a predetermined representation against the object displayed on the display screen from a side of the determined surface. The predetermined representation includes a representation indicating an attack against the object from the side of the determined surface. the representation executor is configured to carry out a plurality of predetermined representations against the object in accordance with the plurality of different touch operations.